A law enforcement officer is like a vampire: With limited exceptions, an officer cannot come into your house without an invitation. In the case of a vampire, the invitation comes in the form of a human who clearly hasn’t seen any vampire movies. In the case of an officer, the invitation comes in the form of a human who clearly hasn’t seen any episodes of any cop show ever. Or it can be a judicial warrant (and some other exceptions). Law enforcement officers come in all flavors: regular police officers, Sheriff deputies, FBI agents, DEA agents, ICE officers, and others. They all have to respect your constitutional rights. Here’s another thing we know about law enforcement: You usually aren’t legally required to talk to them. We covered this before in Your Legal Guide To Getting Arrested. You—a U.S. citizen—don’t have to say anything to an ICE officer who just walks up asking questions. What I would do—because I like to see how barely restrained power asserts itself on everyday folk—is ask through the door if they have a search or arrest warrant for me. I bet they won’t. ICE agents generally don’t have judicial search or arrest warrants. It wouldn’t even make sense for them to have a search warrant for your house, anyway. Even if they had a judicial arrest warrant for your neighbor—and if she was actually hiding in your house—arrest warrants are generally not enforceable at a third party’s residence. How do you know it’s a judicial warrant? It’s signed by a judge. We’ll get to the kinds of warrants ICE agents primarily use in a bit. If you do want to talk to ICE agents (maybe to get some good info for your neighbor) state through the door that you’re coming out to talk to them, step outside, and then close the door behind you. But don’t forget your keys—nothing looks worse than a locked-out chump who exercised his constitutional rights. Letting law enforcement into your house—especially in a potential adverse confrontation—is an invitation to all sorts of invasiveness you probably don’t want. Based on the fact that your neighbor’s a great member of your community and had a kid born in the U.S., I’m going to assume that she’s been in the U.S. for more than two years (it took me that long for my neighbor to stop raking dead leaves onto my lawn). This is very important. The immigration landscape is probably about to change dramatically, and two years is the magic number. Back in 1996, Congress gave the executive branch power to authorize “expedited removal” for undocumented immigrants who had been in the U.S. for less than two years. This means no judge, no hearing, you’re pretty much out. However, every president from the time that law was enacted—Clinton, Bush, Obama—generally applied expedited removal only in cases where the undocumented person has been in the country fewer than 14 days and usually at the border or an entry point (like an airport). Based on a recent executive order, Trump is expanding the scope of ICE’s power to its full authority. “The law will allow them to arrest any undocumented person they find anywhere in the US—not just at an airport or the border. The 14-day limit will be gone—it’ll be two years,” explains Shusterman. So the old rule-of-thumb of clamming up and saying you have the right to a lawyer is soon to be outdated in some ways, and might be harmful to some people. A new rule-of-thumb: “I would recommend that anybody who’s undocumented and has been here over two years at the very minimum—even though I don’t want them to start making statements and giving a lot of facts to ICE—should at least have enough paperwork on them to convince an ICE officer they’ve been in the U.S. for at least two years,” says Shusterman. Let there be no doubt, though: Your neighbor can still get arrested, but at least she’ll get in front of a judge, and if she has any arguments for relief from deportation, she’ll be here for at least a few years thanks to bureaucracy and the massive backlog our immigration courts are seeing. As of a few weeks ago, there’s a backlog of 542,411 cases with an average wait time of 677 days, and the number of judges the current administration plans on hiring likely won’t make a dent in that. Whether your neighbor is at home or elsewhere, she should make sure to have documentation ready to show that she meets the two-year threshold. She should also have the name and contact info for an immigration attorney that she trusts. Finally, just like you, your neighbor should ask to see a warrant before opening the door. 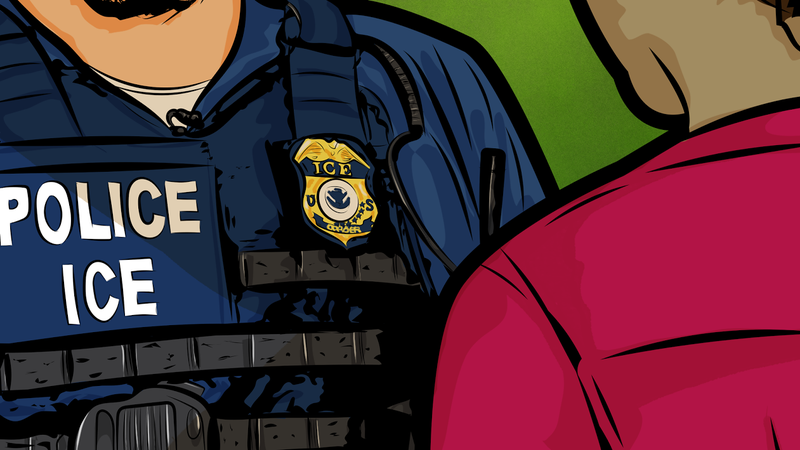 ICE agents often rely on administrative warrants—which are not signed by a judge. The warrants they use allow them to arrest an undocumented immigrant but they do not permit the ICE agents to enter a private home without consent. Judicial warrants—those signed by a judge—have the express purpose of the warrant written on it. If your neighbor does feel like having a face-to-face conversation with ICE, same as in your situation, she should step outside. By letting them in for a conversation, they are now free to search and arrest others inside. ICE settled that case with the ACLU. Understandably. Your neighbor’s in a tenuous situation but, being in the U.S., the constitution still applies. When it comes to entering a private space, warrants are still required, and usually that comes from a judge, not from an officer’s balls. Dan Ralls—previously known as “A Lawyer”—is a practicing lawyer with years of broad legal experience. He is part of the team at Unwonk Podcast and can be found on Twitter here and here. You can also find him on Medium sometimes. His opinions and conclusions are, of course, his own. Keep in mind that this is general information, and not formal legal advice or legal representation; if you need any of that, get it from a lawyer in real life, not an internet column. A legal problem is serious and fact-specific, and you should treat it accordingly. But you have common sense and already knew that.